I can be a bit of a hoarder. I have this ability, or disability if you would, wherein I can accumulate massive amounts of stuff I don’t really need without ever subtracting. Part of this mentality is a psychological attachment to innate objects, something I might have to workout on a therapists couch someday. Recently, my wife has gone on a bit of a purging tirade and we have, little by little, gotten rid of that which we do not need. It has been nice removing the clutter from our house and I believe most of us could use some purging from our training programs. First things first, there are about 5 to 6 fitness professionals that I trust. Brett Contreras, the man behind this chart, is one of them. 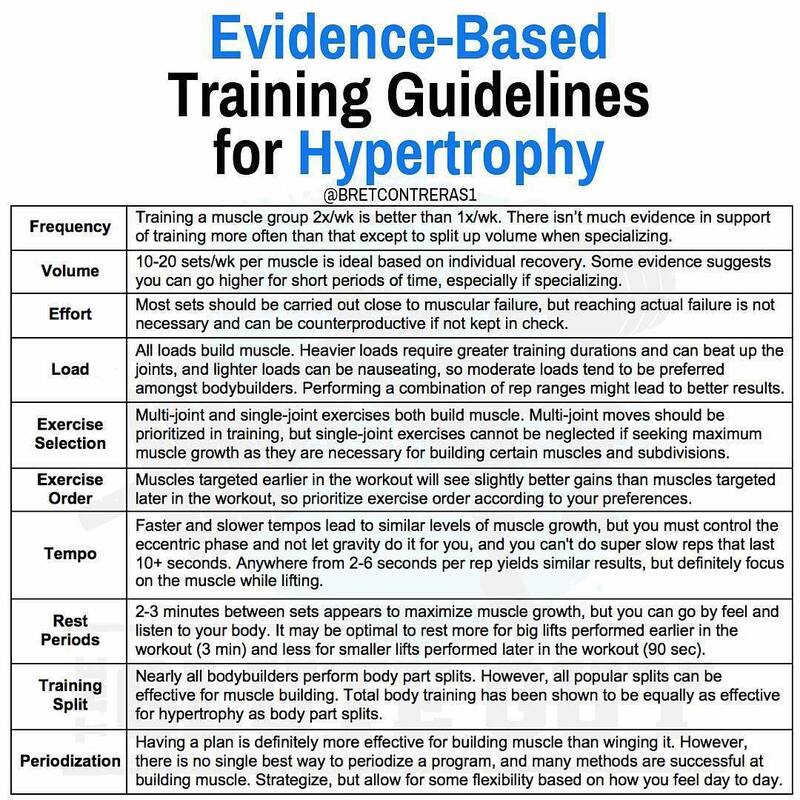 Frequency- Training a muscle group 2 to 3 days per week is more effective than one day per week. Volume- 10 to 20 sets per week per muscle is ideal based on individual recovery. Something you should consider here is the involvement of multiple muscles at once on big money exercises. Squats will involve the quads, the glutes, the core, the lower back, the upper back and the hamstrings. If you train with squats for quadricep growth, I would include 2 sets of hamstring work toward your weekly totals as well, the body doesn’t work in isolation on compound exercises. Effort- To elicit growth, sets need to be carried out close to failure. Pushing sets close to failure is less risky with lighter weights than with heavier weights. If you are performing a deadlift in the 1 to 5 rep range, it’s probably a good idea to stay away from failure and finish each rep with crisp technique. If you are performing sets of 6 to 20 reps you should probably stop a rep or two short of failure. Exercise selection/order- compound exercises such as squats and deadlifts are very effective at building muscle. Isolation exercises such as lateral raises and band abduction work will also build muscle. Train the compound exercises early in the workout and finish the session with some lighter isolation work. Tempo- each rep should last between two and six seconds . You want to lower the weight under control and you should raise the weight under control. Rest period- On heavy strength exercises you want to allow 2 to 3 minutes of rest in between sets. Have you strength training is very demanding on the nervous system, Your muscles might not feel fatigued but your nervous system does need to reboot between sets. On the lighter exercises you should allow about a 1:30 rest between sets. That does not allow much time to find the perfect selfie angle, sorry kids! Training Split- my favorite training split is four days per week, Mondays and Thursdays would be upper body work, Tuesdays and Fridays would be lower body work. Pick 4 to7 exercises per day and adjust the sets, reps and weight to your goals. Remember, 10-20 sets a week is optimal. Start with 10 sets and see how it goes. If you have any questions please shoot me a DM or an email and I’d be happy to help! I should probably go find a psychologist.